IT WAS IN THE SECOND SPRING of Gal Dabara’s mid-winter summers that the Demons came. Why they chose this season to fly in, lord only knows. Straight over the steamy marshes they did hover and glide, looking for objects that remained as mysterious as their movements. Their strange silvery bodies glinted in bursts of iridescence as they bobbed about, leathery wings shimmering peculiarly in the haze. We watched spellbound, breath bated, from our place of cover beneath the huge spread of split-leaved rainforest philodendrons that Flynn said had been introduced here by an earlier expedition from Earth. Typical of our species, I reflected ironically. Always got to interfere with someone else’s territory. Back home, Europeans had messed with the lands of other indigenous peoples, introducing rats to the Pacific Islands, placing placental mammals amongst Australia’s marsupials, slaughtering great herds of herbivorous grazers in Sub-Saharan Africa and North America, and generally causing ecological havoc wherever they went. They’d even messed up their own backyards. The British Raj in India had brought back rhododendrons from the Himalayas as an ornamental shrub, which had not only taken root readily in English soil, happily hybridizing with previously introduced strains, but had since become so invasive that the National Parks Authority in parks all over the country were engaged in a new concerted effort to get rid of them. That’s a whole heap of havoc we’ve inflicted upon ourselves. And we’re still causing havoc centuries later, now that we’ve starting spreading out among the stars. Before I came here, I’d heard that Earth already had several failed attempts to terraform Gal Dabara. But the planet always managed to thwart Earth’s efforts. It was almost as if it were a conscious and very powerful entity, or at least, controlled by one. The fact is that terraforming is a time consuming planet-wide operation, analogous to large scale cultivation or urbanisation but vastly greater in magnitude. It requires the annihilation of one environment in order to replace it with another. The natural world is remarkably resourceful and fights back indomitably against such invasion. On Earth many once thriving civilisations have since vanished without trace beneath impenetrable blankets of forest regrowth. It was a wonder that the philodendrons had not been rejected on Gal Dabara, but then they’re incredibly tenacious epiphytes that take readily to any soil, quickly producing shoots that clamber up the sides of trees with alarming rapidity to nestle along the branches. Once there they require little to flourish, absorbing moisture and nutrients in the hollows along the upper side of the branches from a network of thread roots, while sending shoots trailing over the sides back down to take root in the soil, thus establishing themselves. I could see bunched inflorescences on stems protruding from the centres of the larger leaves, showing that they were reproducing and the equivalent of insect life on this very earth-like world were visiting them, so it was obvious they were thriving. Their compatibility made me wonder if Gal Dabara and Earth had been formed from the same nebulosity and seeded with the same chemical formula before drifting apart to their present locations, while remaining close neighbours on the cosmic scale. On Gal Dabara the supplanted philodendrons were a successful alien invader; for me they were a gift from my native world. I was glad of their cover. I watched the Demons, wondering whether they knew we were hidden not far from them – whether they had some way to detect our presence, such as by scent, electrical emission, or with optical capabilities that humans do not posses, like x-ray vision. Besides, those horns sprouting out from the sides of their foreheads have got to be there for a practical reason. It was an established scientific fact that telepathy did not exist – or were the scientists wrong? After all, eels can detect electrical currents, and the neural pathways in the brain are powered by electricity. Could not the electrical activity of thought be tapped into, and with a knowledge of the subject’s language, translated? All you’d need would be the appropriate sensory organ or technology; plus perhaps, the code-breaking expertise of a linguistic psychologist genius. I was abruptly snapped out of my reverie as Brent grunted softly beside me and touched my shoulder. Brent and I turned around to regard Hadlow with a touch of annoyance, but we could see the man was scared. If Brent was scared, he didn’t show it. He was a pretty self-possessed tough-looking individual, who probably knew how to hide his feelings and put up a brave front. I myself was more sceptical and anxious than fearful. I knew that these Demons were just mortal creatures like myself and the rest of the animal kingdom, and not supernatural beings endowed with godlike powers. Admittedly, they could fly, but then that was because they had wings; and though they had a robust bearing, it was owing to their huge shoulders and pectoral muscles, needed to support and aid their wings in flight, and a chest capable of supporting an enormous pair of lungs. But also their bones, though tough and flexible were hollow and feather-light like a bird’s; except of course, that they underlaid wings that were more like those of a bat, composed of tightly stretched skin over an almost needle-thin bone-structure. The Demon that was giving the trouser-filling willies to Hadlow, hovered slowly towards us, eyeing us steadily all the way and then suddenly swooping up over our heads at the last instant of its approach. As the Demon passed over us it looked down and hissed eerily in a manner more characteristic of a reptile. I snickered briefly at Brent’s verbal aside as I watched the Demon depart from the clearing in which we stood, some comic relief was much needed at this juncture. With a sigh, Hadlow slumped down heavily on a flat-topped tree-stump wide enough to support all of our little survey group at once. Mopping his brow he was cursing his luck that he’d ever had the misfortune to set foot on Gal Dabara, but thanking his lucky stars that the Demons had now departed without incident. I figured that whatever they were here for didn’t include dealing with us. They were clearly as surprised to see us as we were to see them. I looked over at the horizon where a huge oblate rugby ball of a sun was setting – all ruby red and streaked with elongated wisps of cloud, ghostly and blue. It would take another hour to set fully, leaving an afterglow providing a slowly encroaching twilight lasting for another hour before nightfall proper descended. It was the dry season, so the sky would be cloudless and full of stars, with a spiral section of the Milky Way not seen from Earth. There was also a moon but that would still be below the horizon during this season, it wouldn’t rise till daylight and would hover just above the skyline like a pale ghost with dark areas across its face, just like Earth’s satellite and about the the same apparent size, before dipping out of sight again a few hours later. There were two other moons but they were small captured asteroids that moved across the sky in tandem like twins and orbited much further out at the zenith, so that when they were visible directly overhead, they appeared as no more than two large bright stars. “Who the hell are SG Inc?” Morton asked. “Surveyors Galactic Incorporated, my negligent employers.” I replied. The forceful tone of demand in his Texan whine wasn’t lost on me, but I had too many duties in this assignment to spare time pandering to each man’s individual needs. Besides, I knew about his drugs habit. He’d been in and out of rehab several times, and as leader of this survey expedition, all relevant details of draftees are passed to me via hyperlink. I was also aware of the way addicts gained access to their substances out on the frontiers. The supply ship was on a very busy route and took mail orders without much question and no inspection beyond strict scan searches for dangerous volatiles such as toxic waste, radiation hazards and nuclear devices. By default it provided an unwitting but guaranteed two-way flow for a plethora of drugs and other questionable substances. “The supply ship’s due on the 17th between noon and sixteen hundred hours local,” I said, consulting my n-pad. “But you won’t be needing it, as we’ve now finished our survey and taken all required readings and vids. We’ll be leaving tomorrow morning,” I added, hacking down a trailing vine in my path with my antique Dundee sheath knife. I realised these men were low-paid draftees serving a voluntary penance instead of a mandatory sentence like the last bunch I’d been saddled with, which didn’t make my job any easier, considering this bunch seemed to complain as much as any unpaid draftee. I was aware also, that aside from a couple of cases of fraud and embezzlement, some of these guys had only been sentenced on minor misdemeanours, and none of them were convicted murderers or certified psychos. Still, I wished the SG would allocate me a proper team of assistants as I deserved, instead of saving their budget fobbing me off with these sometimes burdensome draftees. I noticed that the party was getting too spread apart. Suddenly I found myself missing the presence of certain faces and voices. I looked back at the almost single file procession behind me and began to count heads. Including myself there should be exactly thirteen of us altogether in this breakaway party. Aside from me, I could only see eight, there was still another four to account for. I decided to take a roll call. I studied my n-pad, scanning the list of names, checking them off in person as I called them out. “Ferguson and Minton, and Leonards and Hulbert,” I answered. Edgar Minton was not a draftee; he was the party’s official survey consultant and Jim Ferguson was the volunteer survey assistant. “I saw Leonards and Hulbert stopping together a while back,” said Hadlow. “They’re regular heteros,” said Flynn. I cursed again. This time a bit more vehemently. We began retracing our tracks and had hardly turned the bend on the pathway when Leonards and Hulbert came hurrying breathlessly into sight. When we reached our destination, Minton and Ferguson were both hunched over in a squatting position, studying something at the side of the jungle path. “Look here,” said Minton as we approached. I saw strange but familiar imprints in the muddy soil. They followed the side of the pathway for several feet before veering off at a sharp angle into the undergrowth. I leaned closely to examine them, recognising them instantly. They were the footprints of a Demon. The heel, arch and forepart were similar to a human’s, but the toes were clawed. “Hmm,” I said, but nothing else. We’d all witnessed the Demon’s unexpected presence here earlier, but out of sight is out of mind, and I didn’t want to unsettle the others in my charge with any reminders. “There are no sentient beings native to this world are there, Daniels?” Morton’s eyes were narrowed searchingly at me as he spoke. I took a few photos of the footprints on my n-pad, zipped it away in my environment suit and stood up. “Anybody else?” I said, spreading my hands. “Yeah, something to show the family back home when I finally get clear of this dump and my societal obligations,” growled Boone. A queue formed behind Boone and within a short space of time there wasn’t a member of the group that hadn’t taken photos of the alien footprints. As far as I was concerned, they were all wasting their time. I knew they would find nothing on the subject. I’d already checked extensively to see if any other parties were in the know – and not so much as a glimmer had come to light. We reached a narrow pathway in the undergrowth that bridged a chasm with a hundred foot drop beneath us. The path sloped upwards for another fifty feet to a flat-topped summit fringed with spiky umbellifer trees. There was a sheer vertical wall flanking its sides and a drop of at least a hundred and fifty feet to the invisible chasm floor, hidden from our sight beneath an unbroken cover of shrubs and undergrowth. Every now and then we saw rippling movements beneath the undergrowth as creatures of unknown nature passed by. Casting my eye over his plump and portly figure, I was of the opinion that this was probably the only exercise he’d taken in months, and didn’t wish to have someone suffer a heart attack under my charge. I paused, gritting my teeth in annoyance that my employers had neglected such an important obligation. That’ll cost them heavily I decided, raising my expenses invoice a good few notches with my calculator. I called a halt to our advance and surveyed the placing of the mini plateau and its surroundings thoughtfully. It was nearly circular in shape and around twenty feet in width, sufficient for our present party of thirteen individuals. We hadn’t yet located the others and because of atmospheric interference were unable to use our stellphones to contact them. There was no way we were going to call out and advertise our presence to all and sundry. I was still worried over the unexpected arrival of the Demons, despite the fact that they had virtually ignored us in our brief encounter earlier. As the twilight drew in, casting a gloomy aspect upon the landscape, darkening the shadows to intense pools of inky blackness and muting the hues of trees and foliage to a dull uniform grey, I reached in a pocket of my environment suit for visual back-up. ”These night vision goggles are a boon,” I murmured, donning them and suddenly confronted with a scene as bright as a sunny day. “Ah, the man’s got night-goggles,” Flynn said. I froze in my tracks at a sound like the snapping of a twig as something prowled in the undergrowth nearby. There was a fluttering sound thrashing about wildly, followed by a low growl and a scream. We all stood like statues, frozen in various poses of movement and all facing outwards towards our surroundings. I saw several of my party reaching into their pockets and belts and pulling out objects . . . knives . . . sprays . . . compact devices such as sonic, osmic, photonic and electronic gadgets that could be used as weapons. We waited – breath held. You could almost hear the silence. Then suddenly, a crashing in the undergrowth to one side and some low-slung, knobbly little creature with numerous arms and legs and covered with clumps of tufty bristles dashed across our path, taking a quick look up at us with wondrous eyes on the way. Then it was gone. And a hushed silence fell over us all for a few seconds, till we all started talking and chuckling together at the same time. Panic over, peace reigned once more and I retired to a corner to think things through. As the twilight deepened and the darkness descended the sky brightened, and with the light from a host of stars and a broad section of the Milky Way stretching nearly halfway across the circumference of the horizon and hovering a quarter of the way to the zenith, visibility of the surroundings became suddenly comparable to a moonlit night.
. . . I sat down on a grassy knoll in a glade screened by giggling gurlag bushes, although they didn’t giggle at all, it was just that when breezes ruffled their leaves, it produced a tiny tinkling sound almost like girlish laughter. But if some being or creature should cross their barrier, the tone of the leaves would automatically rise or lower in pitch without any increase in volume, producing a subtly different sound which acted as a ready-made alarm system provided by nature. Knowing this, I realised that here was the low-key alarm system we needed and stationed myself close enough to the gurlag bushes to make full use of their services, while I set about gaining as much information on my present situation as I could. With n-pad in hand I selected ‘Nocturnal activity on Gal Dabara‘, scrolling through a series of survey reports with a measure of amusement and disbelief. The collective title was, ‘The Secret Sentinels of Gal Dabara’ . . . The first one stated that the night was a time to avoid, when the jungle came alive to a host of nocturnal predators: the Shterg, Kimera, Dromwitch, Gusbag and Grimbel, who floated around just above the lower, canopy so you couldn’t see them till they suddenly dropped down . . .
. . . This report was cobbled together from previous surveys, one of which I’d made myself. I recognised the names I’d invented for some of the lifeforms we encountered. There was no definitive scientific basis to the nomenclature. It was all whimsical tongue-in-cheek stuff, based on the spur of the moment impressions. I shook my head, and ploughed on through the report, reading it as if I’d just found an old diary of mine and was rediscovering past events I’d half forgotten, mingled incongruously with surprise snippets that were utterly new to me . . .
. . . There was the Gurval, Jarmoth, Zombatch and the four-armed Frigga which lurked in the branches chuckling mysteriously and the dreadful Groth, that crawled along the sides of tree boles and sprang out on unsuspecting travellers reaching out graspingly with its three-fingered tentacles.
. . . Even the planet’s name was provided by someone compiling a survey report with no source reference. There were no sentient beings on Gal Dabara with a language or system of writing to tell us the word for their homeworld . . . I decided to have a word with Minton regarding the nomenclature. As the official survey consultant, Minton had conducted various surveys in this sector of the galaxy, several at least here on Gal Dabara and I figured he might be able to throw some light on the subject. I rose from the grassy hillock and rejoined the others finding Minton also still awake and reading something from an n-pad. I went over and questioned him. “It’s not an arbitrarily concocted name and it’s not from an alien language,” said Minton. “It’s a description,” said Minton. “That means they’re space travellers like us also, but I’ve never seen them with anything resembling a trace of technology,” said Minton. “Are you asking me to believe that they flew here through space? That’s crazy!’ Minton’s eyes nearly bulged out of their sockets with incredulity. “What do you think the horns might be for?” I added. “For head-butting or because they’re bipedal herbivores that eat grass and chew the cud, and it’s a side-effect of their diet,” scoffed Minton. I chuckled at his remark. I rose from the grassy knoll and returned to my inflatable weatherproof, setting the contours to sitting mode. Still too wide awake and my mind aswirl with questions, I sat down n-pad in hand.
. . . I selected ‘Demons’ and scrolled down, bypassing mythology, religion, folklore and fiction and clicking on ‘planetary species’. Several entries were presented. One was a series of blogs requesting information on The Demons. I changed my search to ‘The Demons: homeworld and origin’ . . .
. . . I found the entry, ‘Demon Homeworld and origin’ – selected it – ‘This entry cannot be found’ – ‘Entry unobtainable’ . . . Next, I tried . . .
. . . ‘Who are the Secret Sentinels of Gal Dabara?’ The answer came back. ‘Unknown’. ‘There is no information on this title’. . . I was getting nowhere fast . . . but kept going . . . Through a roundabout procession of question and response, the eventual answer came as a shock . . .
. . . ‘The SG – Surveyors Galactic Inc’ . . . ‘manifest in a consecutive series of representatives by the agent currently contracted to conduct procedural duties for their client on Gal Dabara’ . . . That’s . . . Me, I realised . . .
. . . ‘Who is the client?’ I enquired but received a negative response. ‘Information not supplied’ . . .
. . . “Brilliant,” I murmured. “Another dead end” . . .
. . . I laid back on the inflatable weatherproof, adjusting the contours to armchair comfort, deckchair mode . . . n-pad in hand . . . head supported by the headrest gazing up at the stars . . . wondering . . . thinking . . . dreaming . . . Despite all the ill omens regarding the nocturnal horrors of Gal Dabara’s wilderness, our precautions proved sufficient, and the night passed without untoward event. In the morning the atmospheric conditions had improved and we managed to make stellphone contact with the remainder of the main party. We met up at the departure point and a couple of hours later the star-liner arrived to take us all back across the local arm to our various ports of call. I decided that I was going to take a long sabbatical from my stressful professional life, doing nothing more hazardous than just taking it easy. For a while, I was going to become a retired service-veteran come-troubleshooter leading a more laid-back lifestyle. “And, demons aside, may the devil take care of the rest,” I said. But still, I could not shake my mind loose from the questions that plagued me. There were to my mind, mysteries as yet unsolved, that I just could not let go of . . .
Contract Employee for Surveyors Galactic Inc. The Galactic Institution of Chartered Surveyors [GICS] is a professional body that accredits professionals within a fifteen thousand lightyear radius spanning the Terran expansion and exploration sectors of the Orion Spur and the Perseus Arm. Members holding GICS qualifications may use the following designations after their name: MGICS [Member], FGICS [Fellow], AGICS [Associate]. The Milky Way is a barred spiral galaxy [type Sb, Sbc, or SB] that has a diameter usually considered to be about 100,000–120,000 light-years but may be 150,000–180,000 light-years. The Milky Way is estimated to contain 100–400 billion stars. There are likely at least 100 billion planets in the Milky Way. The Solar System is located within the disk, about 27,000 light-years from the Galactic Centre, on the inner edge of the Orion Spur which juts out at an angle from the Perseus Arm and faces inwards towards the outer curve of the Sagittarius Arm. The rotational period is about 250 million years at the position of the Sun. 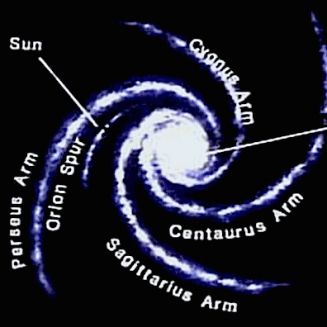 The Milky Way as a whole is moving at a velocity of approximately 373 miles [600 km] per second with respect to extragalactic frames of reference. The oldest stars in the Milky Way are nearly as old as the Universe itself and thus likely formed shortly after the Dark Ages of the Big Bang. The Milky Way has several satellite galaxies including the Large and Small Magellanic Clouds and the Sagittarius Dwarf and is part of the Local Group of galaxies. The largest and nearest neighbour of ours within the local group is the Andromeda Galaxy [also known as *NGC 224 and *M31] at a distance of 2.5 million lightyears from us. The Local Group of galaxies are a part of the Virgo Cluster, which along with a collection of other galactic clusters is a part of the Virgo Supercluster, which itself is a part of the Laniakea Supercluster . . . and the story doesn’t end there . . . the superclusters form walls and filaments across vast reaches of space . . . forming our entire universe . . . outside our universe other universes are said to extend in a collective known as the multiverse . . . the multiverse is theorised to be contained in a bubble amongst whole swarms of bubbles stretching on beyond . . . how far we don’t know . . .